Sharon O’Toole is a contributor to Writers on the Range, the opinion service of High Country News. She is a rancher and writer in Wyoming. Imagine a proposal to introduce an exotic species to the sagebrush steppe of the American West. This species could successfully reproduce and expand into forested areas, uplands and wetlands. It would be a large charismatic creature that attracted a passionate following — people who loved it so much that the management of its expanding population would be restricted by law. Some of them would be so passionate that armed guards would be necessary at academic meetings about the species. The downside of this beautiful animal would be that it outcompeted native wildlife, plants and insects, degraded water sources and turned grasslands into deserts of cheat grass or dust. As its numbers increased, native species would be devastated. The cost to the public of supporting these creatures would increase each year until it was projected to exceed $1 billion in 20 years or so. And ultimately, when the natural resources were exhausted, many would starve or die of thirst. The act further details practices like the removal of old and sick animals as well as the removal of horses from private land — private landowners are forbidden from shooing them off. It also covers proper adoption procedures. But in reality, due to lobbying efforts by horse advocates, actions by Congress and the lack of adequate horse management funding for the BLM, the wild horse population has exploded beyond the tipping point, both ecologically and economically. Horses cluster around the scant water resource in the Maverick-Medicine Herd Management Area. Go to the websites of wild horse advocates, and you’ll be told that wild horses, unlike their domestic counterparts, cannot overgraze or harm other wildlife species, and that they are native to North America, despite arriving on Spanish ships alongside pigs, cattle and sheep. These supporters further argue that if only greedy ranchers would stop raising cattle and sheep, an infinite grass resource would exist for an exponentially expanding wild horse herd. Never mind that those ranchers produce food, manage the resource and support their local economies and communities. The arguments of these advocates are countered by facts on the BLM’s website. Forty-six years ago, an estimated 17,300 feral horses and 8,045 burros were on the range. In March 2017, about 73,000 horses were counted on the range. Another 46,000 were held in corrals, 29 percent of the total, and “eco-sanctuaries” held 1 percent. 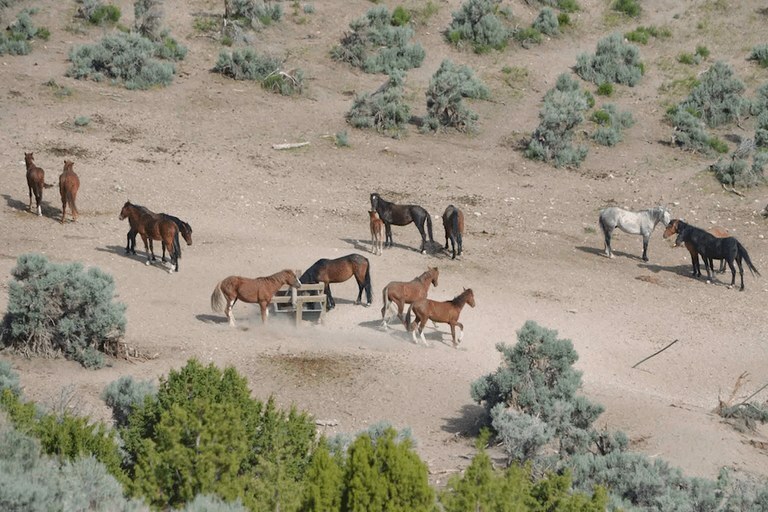 These feral horses cost the BLM about $50 million per year, or 63 percent of the agency’s total annual budget of $80.4 million for the program. Adoption, which is difficult and costs about $4,500 per horse, has declined by 70 percent over the past 10 years to 2,912 in 2016. Fertility control has helped some, but the drug PZP must be administered every year to each mare. This is physically impossible in large rugged horse management areas, and it requires horse “gathers,” which some advocates consider unnatural and overly stressful. Spaying is not safe, because the mares are pregnant virtually all the time. Left unchecked, each herd increases by 20 per cent every year and doubles in four or five years. These numbers do not include the estimated 100,000 animals within Native American reservations. Beyond the numbers is the heart-breaking reality — because everyone, really, is a horse-lover at heart. In our area, many of the horse advocates work hard for the horses and do not want to “love them to death.” Some even adopt animals. Fringe “advocates” have been effective at lobbying against the slaughter of old, unadoptable — or really any — horses. Only 10 states have horse management areas, and most of their congressional representatives want to find a better solution. It is easy for people in the other 40 states to be swayed by the extremists. Their efforts are responsible for the current situation, in which taxpayers support at least 80,000 excess horses, leaving us with no end in sight, not in numbers, not in funding, not in ecological damage. What is a real-world solution? Is there a way through the West’s bitter wild horse wars?